Back to the 26th of September. Still t-shirts around, as DBA, in the 3 edition version. 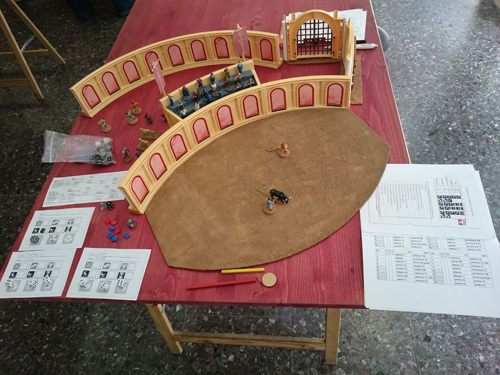 A tournament was held in Rome, the first and maybe the last with this rules version. We waited for this new edition since a lot of years. Its publication was a thing that never happened. And DBA was lacking interest between players. Rules modification proposals were around for years. So the new edition displease almost everyone because everyone had his personal ideas how to fix and improve the game. And the new edition was something other than so many people wanted. It is impossible to create 1000 different rules for 1000 different people. And what was created was not so intriguing to placate unhappiness. Someone found in the rules new inspiration but more people that were dissatisfied now are looking for something else. 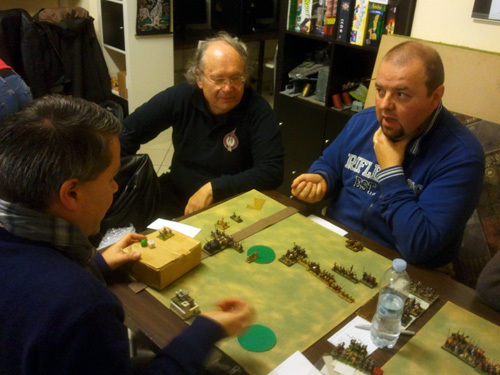 We played DBA tournaments since 2003, so if people want something different, the new edition, with its usual hermetic language, was the decisive event. 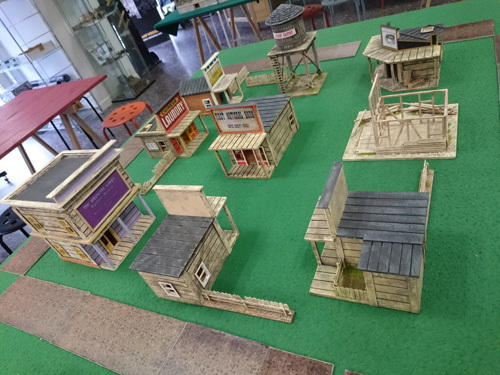 Some western building to play with Torriani rules. 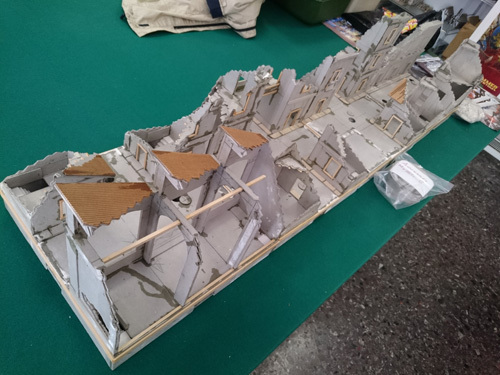 A commission work for a WWII set. 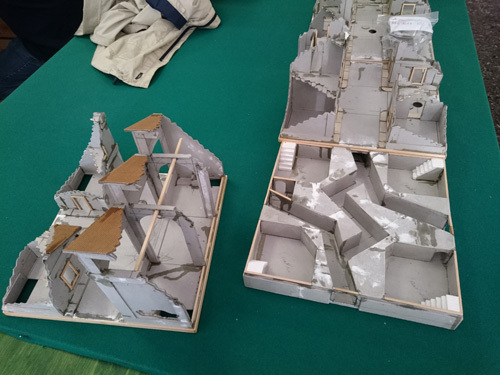 Still unpainted. 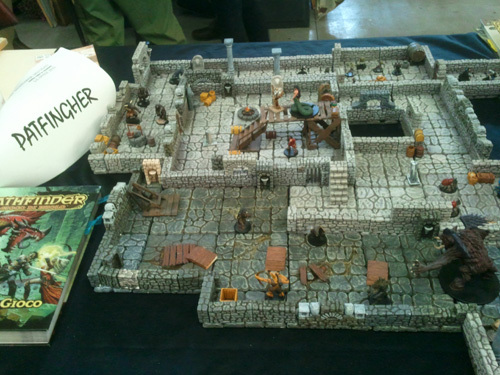 This incredible set is modular, so new parts could be added. 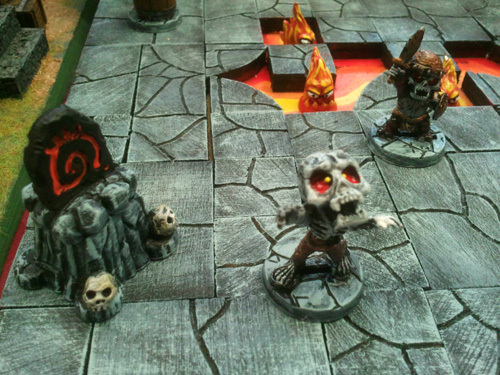 And you can play in sewers and cellars because there is an underground level with parts that are connected too. 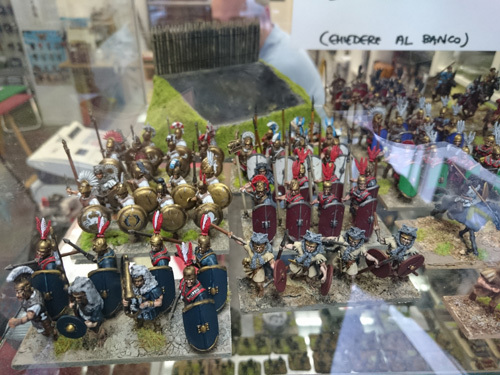 Some 28mm minatures painted by the owner of Solo Giochi. He sells them. It think that the ancient ones are really great. I didn’t play in the tournament. 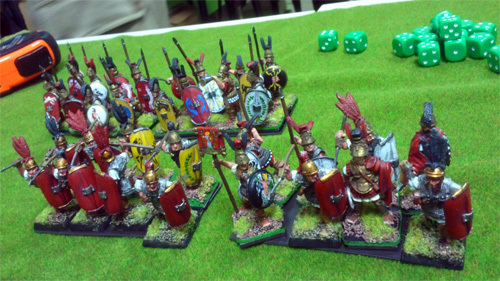 With old edition tournaments I could choose an army (usually a Roman one…) and play without review rules. I hadn’t patience and free time to study new rules. But I wanted to be with my friends at the tournament, so I bring something else with me. Another try for venationes and an opportunity to show my book to customers that were in the shop. 3 copies sold. 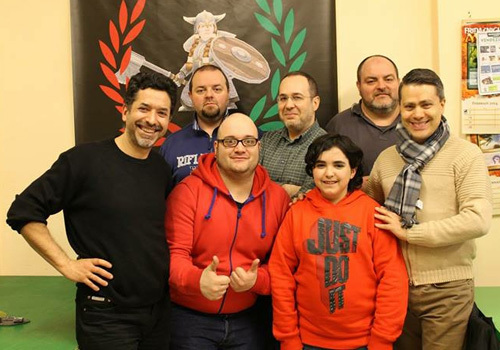 If it could be the last official DBA tournament in Roma however it was not a funeral. We had a lot of fun. DBA is what created our friendship. 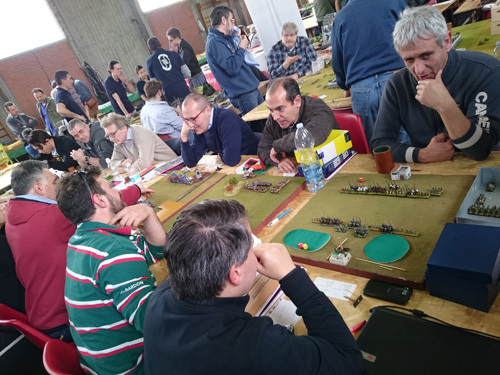 No more official DBA tournaments here in Rome? 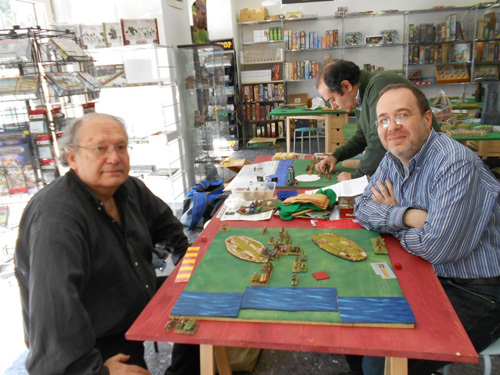 We can always play with DBA, play with other games, and meet for our common passion about wargaming. It is not a matter of rules but only of free time. In the evening a dinner with the local club members and vendors. All meat based, not so great for a not-meat, and not-wine, lover like me. 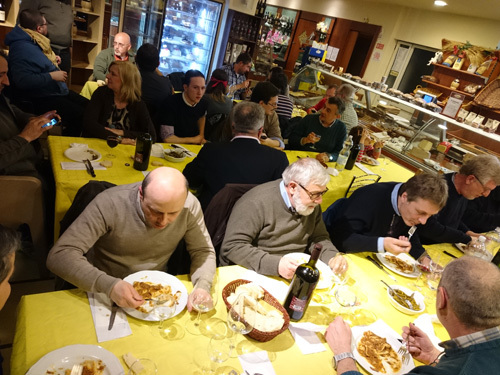 Too much money spent, but a common meal with other wargame people is always a good thing. Night in a budget but fine hotel. And so the convention day. A lot of familiar faces around. 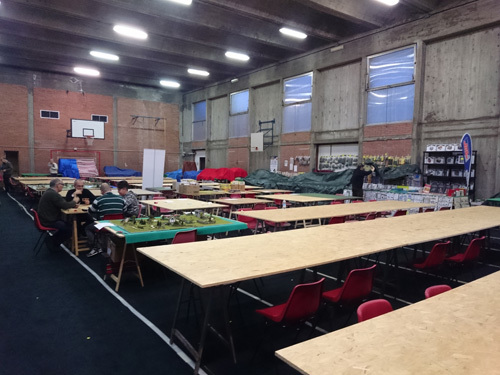 Inside a primary school gym, with vendors along the walls and demonstration tables in the middle. This is the ARSM’s club game. ARSM is the club where Diego plays. Standing you can see “Sua Eccellenza”. With white hair, the other travel companion, a ferrets breeder. 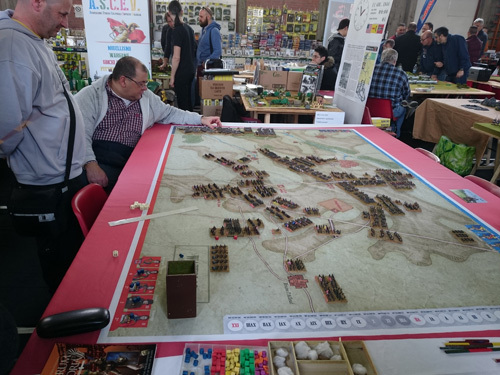 This year is 200th Waterloo anniversary, and this is Waterloo game. 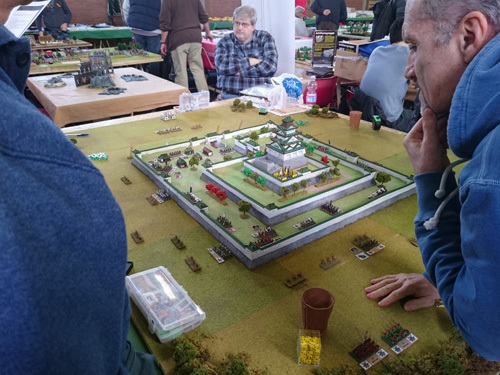 Siege and assault to a Japanese castle. 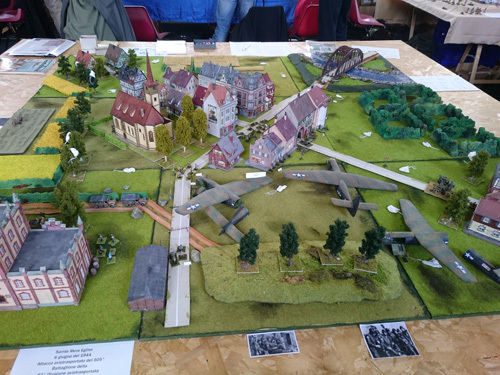 A year too late for D-Day, but still an enjoyable game. 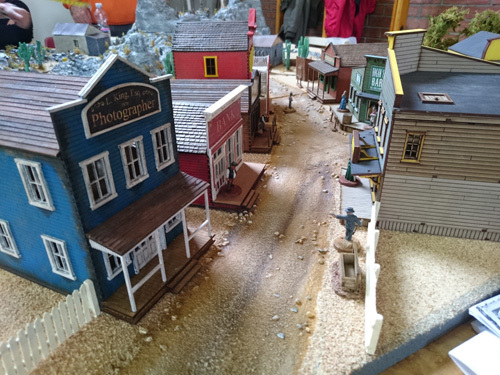 A great Old West set-up. 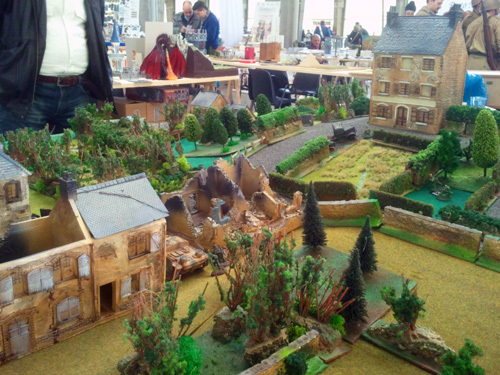 Among other tables, this one with a large amount of 28mm miniatures. 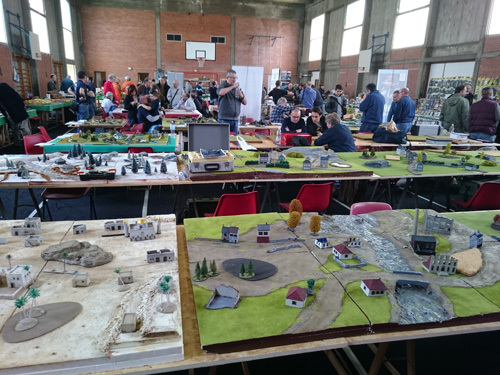 More tables around, but here I don’t pretend to show a full report. 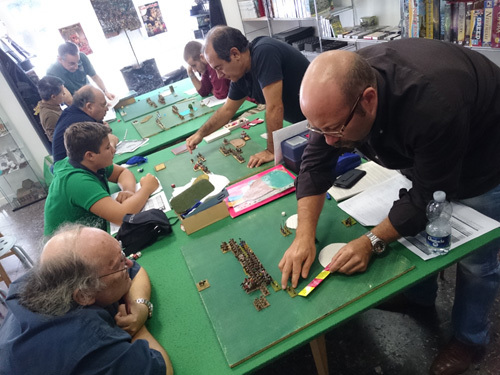 Other things in Hellana were a FOW tournament and this one with DBA 3.0. This year I don’t play DBA, I haven’t mental energy to do it. 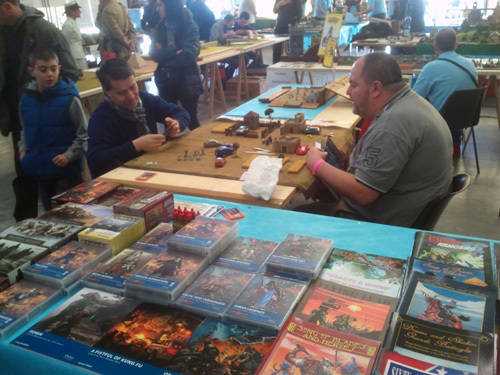 However I’m always near to my tournament friends that play it. 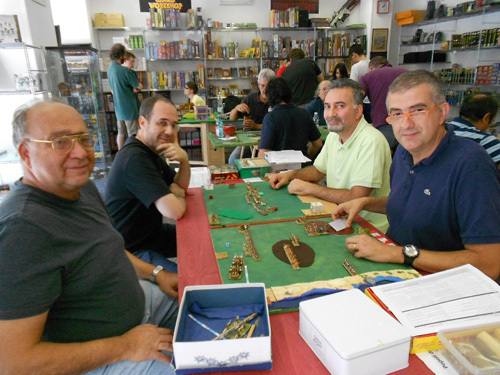 Centuria is a new wargame by Massimo Torriani together with some mates of him. 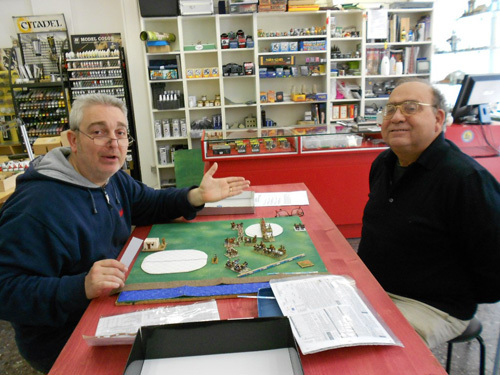 Based on his engine called Operation Squad, they are rules for ancient wargame. 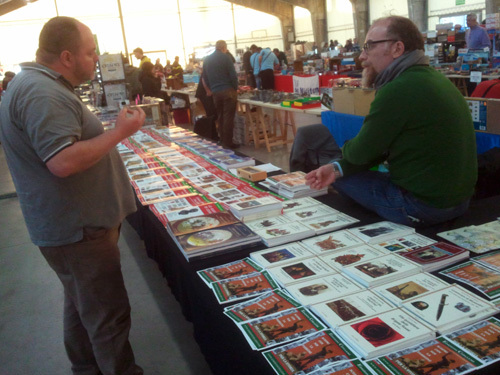 You can obtain better informations on it on http://www.torrianimassimo.it. 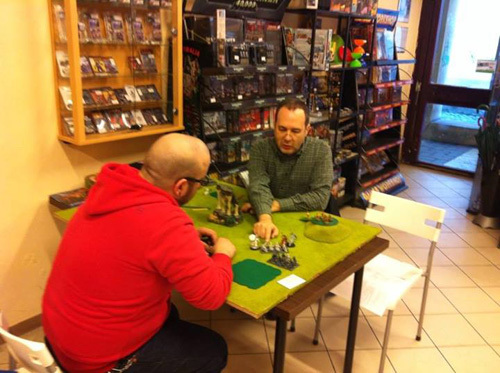 I tried it at Lucca and some weeks ago a tournament was held here in Rome. We were inside a school. Some other games were played in other classrooms. 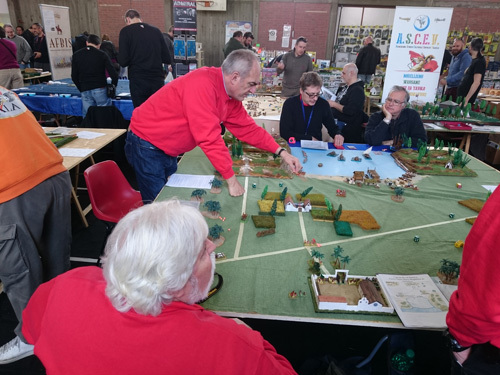 This is the vantage to have a school director as wargamer. 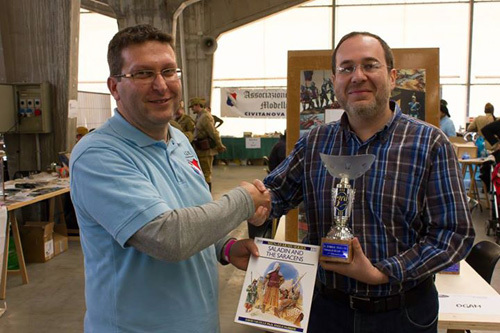 I know something about the rules and engine principles but I didn’t participate to the tournament. I followed all the matches, indeed. 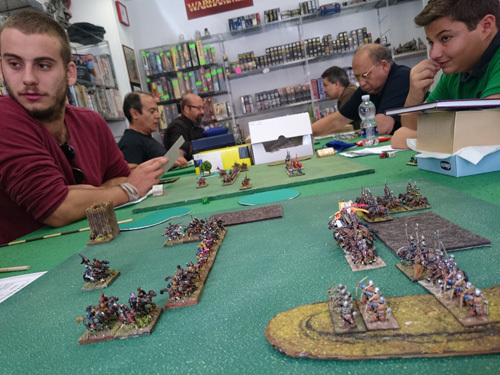 However I stayed more than 6 hours to meet my wargame friends from Arezzo and Firenze, and from Rome too. The last tournament of the year. DBA, as usual. In Terni, again. This time I chose the army list only after a look at the theme. No brush up of rules too. I picked up a list with more knights than other ones. And nothing more. 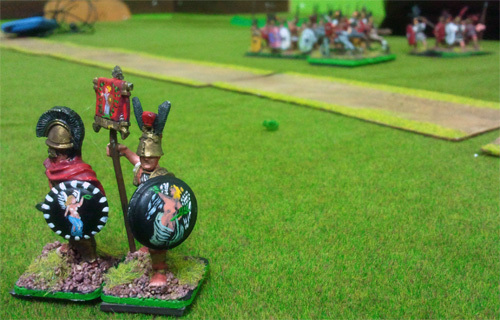 Incidentally it was the Papal one, so I chose to combat with the colours of Rome. As usual. 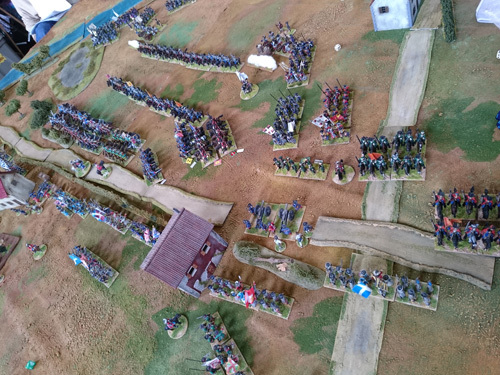 A bloody tournament! 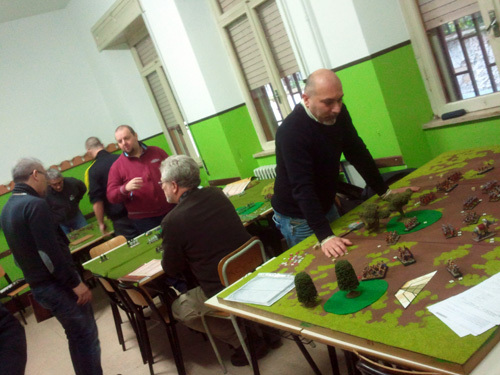 First game: I lose 3 vs 4, with the last throw of the dice to decide who between I and Mr. Gasbarri could win. Second game: I drew 4 vs 4, fighting until the end of legal time, even if I could win. 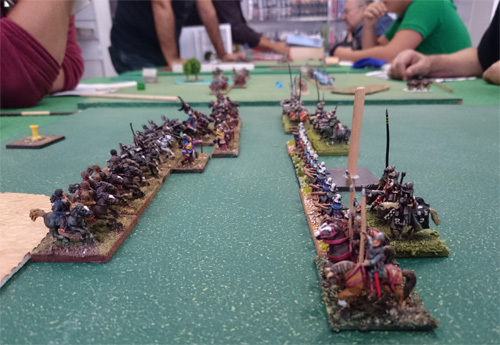 Third game: I won 5 vs 4 with my general dead, and the last turn with 3 dead of mine. 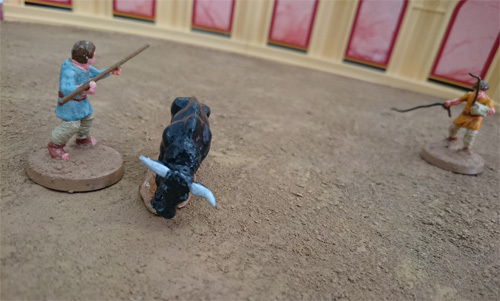 Forth game: I won 4 vs 1, a result obtained after the first impact of armies. I reached the forth place, so no cup but maybe a record for body count in a tournament. The next year we are thinking to play with 2.2 edition again because we don’t know very well the 3 edition still. And maybe the 2.2 is more engaging. However in 2015 I wish to dedicate my free time to Ferrum et Gloria, so I don’t know if DBA will be a priority again in my activities as player. 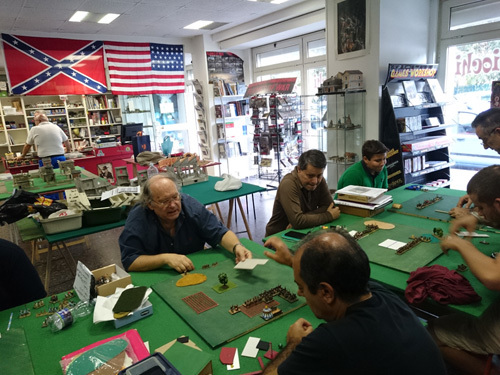 The 12th official DBA tournament in Rome for the Italian Championship, the 11th organised by me and my miniature club chaps, Legio Palatina. However during the years we go from 6 members to 2 members involved, indeed. But children and distances (London, Switzerland, Canino) made the difference. 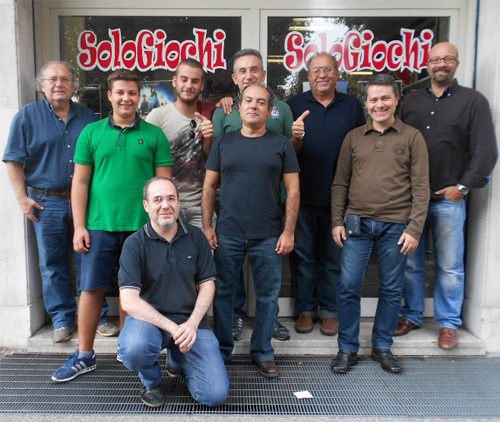 Maybe this will be the last official tournament in Rome because we are a little tired of the same old thing. Even if we like this same old thing. The set was Popoli del Grande Verde, that is the SeaPeople migration wars in 1200 b.C. A beautiful day full of friends. 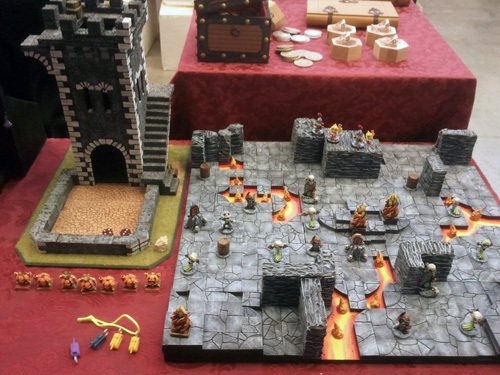 These events are just an excuse to meet friends playing with miniatures. I won 2 and lost 2, the norm. At the end of the day I won a prize with a draw, 40€ to buy something in the shop where we were playing. 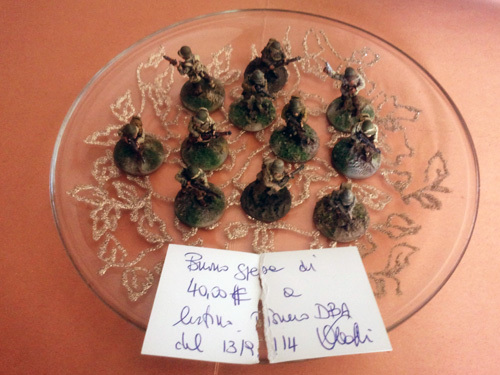 I chose these second hand WWII American soldiers. 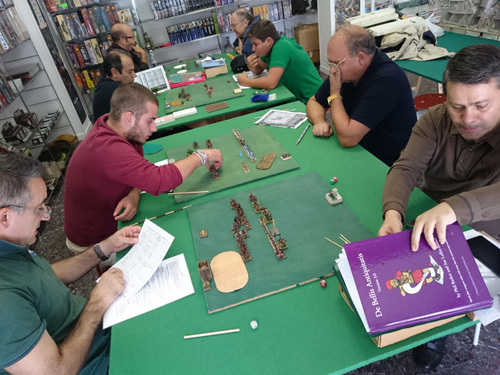 The next DBA tournament will be in Arezzo at the begin of October. DBA 2.2 still lives! 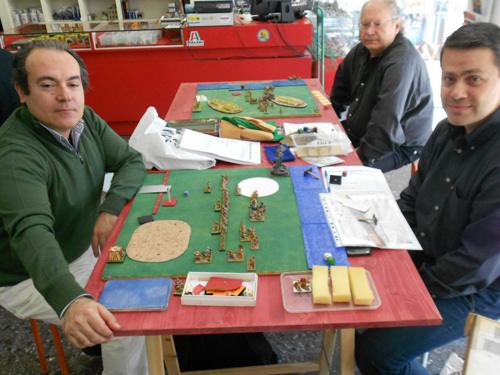 Another tournaments here in Rome organised by me and Diego. It was in the “open” formula, otherwise a match that don’t count for the Italian championship rank. Only few chaps were in the shop where we played because of the advancing Summer feel and family duties. However we had fun the same and we were more relaxed.